"On Saturday pest control arrived and fired 50 mothballs into the nest with a catapult." The local authorities have the same mentality! They should have called some people from real Thailand like people in Chiang Rai. 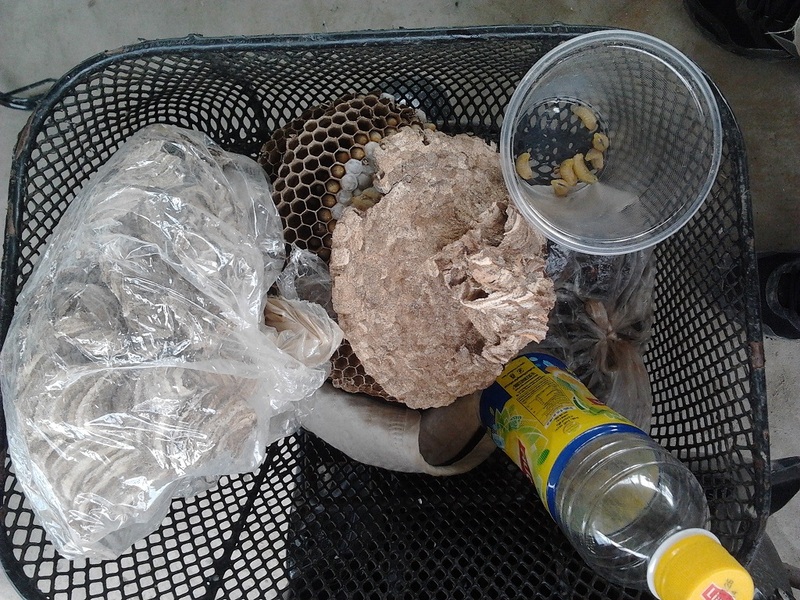 Here they took away a nest from our garden and it was free because the nest was worth like 1500 baht. Not wanting to sound ignorant but where is the 'value' in the hornets nest? Once when doing geologic work in Calif the geologist I was working with was swarmed by hornets. They can sting more than once. These insects made their nest in the dry clay soil and got pissed when I knocked over a tree close by. They did not bother me as I was surrounded by diesel fumes but when I got off the machine to help the geologist I got swarmed also. Not fun! They take the larvae to eat, not the hornets. Their sting hurts so much! As big as hypodermic needles and i was bleeding after an attack! They do it exactly the same way here in the deep south, nearly 2000km from Chiang Rai.. Very interesting indeed. I have watched these same Asian Killer Wasps building a nest across from my house since 24th December 2016. The nest started off as a fist sized ball. It grew steadily untill two weeks ago, when it was finally removed. But Giant Asian Hornets are another story. -- The leading cause of animal related death in Japan I learned from a documentary on NatGeoWild or Animal Planet. And working their way west across China. A nest is on power pole next to my garden. Phuket officials ??? came to see the house on three different occasions and tut, tut tutted their way back to their offices. F A got done about the nests removal. The nest in total height was just over a metre tall. The wasps were approx 6 1/2 cms in length. The nest was removed by setting on fire to it at night and taking the whole thing down. See photos attached. Pity about all the electrical wires obscuring part of the picture. These Asian Killer Wasps are already causing deaths in China, France and have also begun causing big problems in Wales too. Their main danger to the eco systems around the world, is that they destroy honey bees hives and nests. Honey bees are the plants, flowers etc main pollinators. Shooting mothballs into the nest, will only cause the wasps inside the nest to build a covering of nesting spit and paper, to cover the smell. BUT then they will go onto overdrive, increasing the size of the nest, approx by ten cms per month. I am no expert on this matter, but I did observe the wasps progress every day. Actually I wanted to edit my post to read Hornets, not wasps, but the edit button has now been taken off the site? Please read the word hornets where I have written wasps incorrectly. Thank you. We have them in various colours on our farm. I have been stung by the yellow & black ones. They hurt like hell. "Than" is the generic Thai name for wasps and hornets of all types I believe. I think the ones that build a nest like that are red and we had a big nest on our property about 3 years ago which became a no-go are for a while. Eventually someone stole it, thank heavens. I offered to a number of people but no-one wanted to go near it. Then one day it was gone. It was like a round pyramid on the ground about 60cm across at the base and the same height. They were definitely red and I was warned not to get stung by them. After a while I started experimenting by mowing nearer and nearer to it and they seemed pretty cool about it but I never went right up to it. I did spray it from a distance with insecticide streams a few times, ready to decamp in a hurry if necessary but they never came to me. We went away for 2 weeks overseas and came back & it was gone. There was no fence around the property then. It hurt like a wasp would but what I remember is how I saw them truly aim at you like a missile: no landing, just crashing dart first. Impressive. A Thai worker immediately asked me if I was feeling some dizziness or else; obviously they know the symptoms allergic people would feel. He just squeezed the area to expel the venom and within a couple of hours it was all memory. Just a mark on my arm lasting like a week or so.